Sleep disorders affect people at all stages of life. For women, sleep complaints may vary by hormonal status as well as endocrine life stage. Certain broad perceptions about sleep and sleep disorders are supported by population surveys (1). Elderly women seem to have more insomnia complaints, women develop sleep problems with pregnancy and menopause (1-3), and sleep-disordered breathing (SDB) increases in the postmenopausal population (4). Despite these perceptions, study findings may be inconclusive or contradictory. In earlier research, gender-specific aspects are not distinguished within the study populations. Other older studies of women do not identify hormonal condition or cycle status. Formal research in these areas and the differing effects of hormonal status on sleep disorders is a more recent focus of the sleep community. 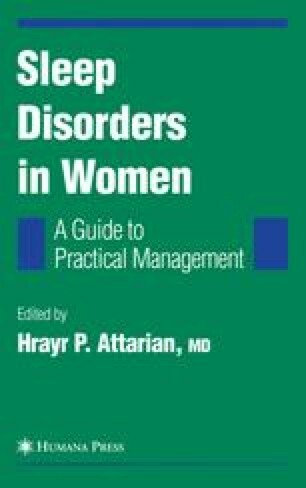 This chapter provides an overview of the current perceptions of the effects of life stage and reproductive status on sleep disorders in women from menarche through menopause. National Sleep Foundation. Sleep in America Poll 2002. Accessed at http://www.sleepfoundation.org, 2002 Sleep in American Poll.